Last week I received an invitation to lead a workshop on assessment in a school in Kiev. Now my first reaction was that I was ridiculously excited - having only just trained as a workshop leader a couple of weeks ago. I immediately went and searched for the school website and then had another look to see what the weather is like in the Ukraine at the end of January (bitterly cold!). Since then I've calmed down of course, and have spent the last few days thinking about assessment and in particular how it can be used to support and enhance learning. The more I think about it, the more I realise that assessment of student work is not just to help the students to do better - it's to help the teachers to do better too. If we agree that schools should be learning communities, then it's clear to me that as well as giving students feedback and allowing them to critique their own work, assessment data can also be used by teachers when reflecting on our own role in the learning process. In particular if we develop a culture of self-assessment in our students as a way of increasing their ownership of and responsibility for their own learning, shouldn't we be aiming to develop a culture of self-assessment in our teachers so that we can also improve our own teaching practice? Some months ago I wrote a blog post about Assessment of Learning -v- Assessment for Learning about how assessment can be used as part of instruction to support and enhance learning. 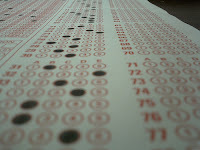 The traditional methods of assessing students using exams of short answers and multiple choice questions that only had one right answers were probably very suitable for the industrial age where students were being prepared for work that relied heavily on mastering one specific skill. Even when I started teaching, these types of assessments were used as a way of "sorting" which students were best suited which which stream in the school - the "top" two classes of this school were more academic and students in these classes were the only ones who ever stayed on at school beyond 16 - the "middle" classes where the students may have gone on to learn skills such as woodwork, metalwork or car mechanics which would have set them up for some sort of trade or apprenticeship - and the "bottom" classes where the students would have left school with almost no qualifications and perhaps ended up as manual labourers down the local coal mine. No student in the "bottom" stream was ever offered the chance to learn a foreign language, for example, as it was seen as wasteful to teach these students things they would never use. The emphasis in those days was on giving the students that knowledge that it was deemed important for them to know, and testing them on that knowledge in a way that encouraged rote recall. Nowadays in the UK there is the national curriculum, therefore education is probably more balanced and there are core subjects that all students should study. The emphasis is on improving students scores in these basic subjects, so it seems that the educational policy makers believe that intelligence is not fixed, but can be developed - that all students can learn and improve - and that there should be equal opportunities for all learners. Never having taught the national curriculum I cannot actually say whether or not this approach has improved learning. In the international schools where I have worked, however, the emphasis has definitely been on encouraging students' different ways of thinking, and there has been much more emphasis on authentic or real life tasks and engaging students in problem solving and performance assessments. In addition, as a result of being in IB World Schools, attitudes and dispositions are encouraged through the learner profile. What I've also noticed is more of a focus on assessment for learning, as opposed to a focus on assessment of learning in the UK which allowed the government to draw up league tables comparing different schools against a national standard. This sort of assessment definitely encouraged "teaching to the test" in order to keep the schools' scores high on the league tables, and teaching to the test certainly had a negative or corrupting impact on good teaching practices. In fact, when I hear the outcry every summer in England over the higher scores that are achieved year on year, it just goes to show me that scores can definitely increase, even if there is no improvement whatsoever in student learning. What then should be the purpose of assessment? If assessment is to move learning forward, then it has to happen at the beginning or in the middle of the learning process so that there is still time for misunderstandings to be corrected and for further learning to take place. Assessment that takes place before and during the learning process gives teachers the information they need to move learning forward or to scaffold the next steps for students who are struggling. One great discussion I had last year was how the pre-assessment provides valuable information that needs to be used to design the instruction - that a KWL chart is not an end in itself. Assessment doesn't have to be a big deal that causes anxiety on the part of both students and teachers, as often happens in the end of unit or end of year exams. In fact it can be carried out as part of the normal classroom routines, so that a teacher can be constantly checking to see that students are understanding the concepts. That's why I find the visible thinking routines so useful as an ongoing way of assessing student learning. These routines allow the students to articulate what they are thinking and why, and they allow the teacher to think about the direction the learning needs to be going next. Yes! Assessment is not just for students, it is so that the teachers can do better too by making informed decisions. Have fun hosting your workshop, I only wish I could be there for it! I think you have done a good job of summarizing the major points that we need to address when thinking about assessment. The work of Richard Stiggins, Thomas Guskey, Robert Marzano, and others has informed much of my thinking on the assessment question. Hope your workshop goes well! Report back on its progress.